Saints star Stephen Myler insists he is not trying to compete against the other three fly-halves in England’s initial training squad despite there being a dream World Cup place up for grabs. Myler might have been part of a Saints side which finished top of the Aviva Premiership table but it is Bath’s George Ford and Saracens’ Owen Farrell that dominate the discussion of who should start at number ten when England face Fiji on September 18 in the opening pool match. As expected, Myler does not view the situation in the same way but stated making the final 31-man squad in late August, and ultimately the starting XV, is not the priority. “George and Owen have a little bit more exposure than I have at this level but I have played against them and we are all working towards the same goal here,” said Myler, who was speaking as part of the England Team at the official launch of the Canterbury England Rugby World Cup kit. “We are not thinking ‘I’m competing against him and him’, we are trying to help the team and that is our role as a number ten. We have to get the best out of the team and we listen to the coaches and how they want the game to be played and what we need to bring out of the players around us and out of ourselves. The 30-year-old is part of a 50-man training squad that will be cut down to 31 a few weeks before the competition. One suspects it would currently be a time of mixed emotions for the players whose places are uncertain: the excitement of what could be a life-changing tournament, combined with the nervousness of potentially missing out. “Personally I’m not trying to think like that. I’m trying to think ‘we are here and we are working as hard as possible to be in as good shape as we can and the end goal is England win the World Cup’,” added Myler. “Each player is pushing the guy next to him which will only make the squad stronger. Not everyone is going to be involved but you are not far aware [from being included]. Unfortunately injuries happen and people get called in – we have seen that at previous World Cups – and we are all striving towards the common goal. Saints’ campaign finished with a narrow play-off semi-final defeat to Saracens in May and despite finishing top of the Aviva Premiership table, Myler believes Jim Mallinder’s side didn’t reach top gear. Their chances of reaching that desired level have been boosted by the signing of Munster’s JJ Hanrahan but the arrival of the talented fly-half does not concern Myler; in fact it is the opposite. He said: “It certainly adds to the strength of our squad and our team. It is only a good thing. It is hard to play almost every minute of every game, especially this season when there were a few niggles. 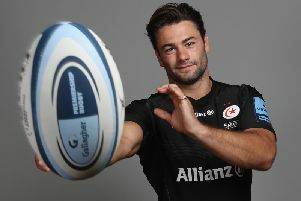 “We have that strength in the squad with England and we also need it at club level and adding to the squad and getting players in my position only helps the squad to perform as well as it can on all fronts.